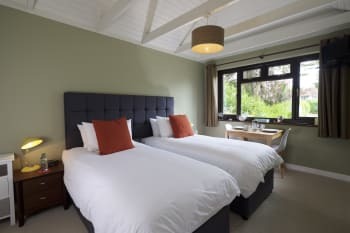 Located in the beautiful Georgian market town of Lymington, we have three contemporary en suite rooms with private entrances, one with its own garden. 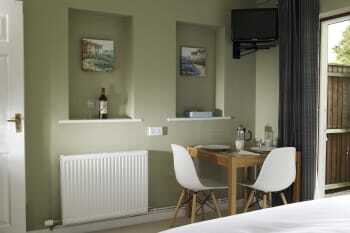 All benefit from superking or twin Hypnos beds, free WiFi and freeview TV. At Rudder's of Lymington there is no need to get up early for breakfast as we deliver our generous breakfast hamper direct to your room. This allows you to enjoy your breakfast at the dining table in your room, or alternatively in bed! Rudders is an immaculate place in a lovely location. Breakfast hamper was so delicious we didnt need to eat all day, and the bread & croissants were served warm. Will definitely return. We had a lovely stay at Rudder's. The room and patio garden were excellent. The breakfast hamper is a fanastic idea and the food was fresh and delicious. Thank you to our host, we will definately be back. I'm delighted that you enjoyed your stay with us so much and we hope to see you again soon. Everything perfect including the lovely breakfasts. We have stayed many times before, and love the beautiful bedroom surroundings, and quietness. Christophe and Zoe are so friendly and welcoming. Too many lovely places to list, but Beaulieu is a must. Thank you for taking the time to write this review and it was lovely to see you both again. Hope to see you again soon. Warm, really clean and a great breakfast hamper! Fishermans Rest was brilliant for an evening meal! Great room, great host and great location. Extremely clean and comfortable room. The owners have put a lot of thought into the room and really thought about what you actually need when away. There are no unnecessary ornaments taking up space, so all the space is yours. Bed was very comfortable, slept very well. The room was quiet. As regards the location, there is a small co-op, a couple of Chinese takeaways and a couple of other places at less than 1 minute walk away. Lymington is easy to get to by car. The breakfast tray was a nice touch and again well thought out. Whenever I go away I normally come across a problem with where I'm staying, albeit a minor one, but I can't think of anything negative to say. I highly recommend staying here. I didn't go away for long, so cannot give many tips. Lymington is nice. Milford has nice views and is good for a walk. Thank you for taking the time to write this review and we are delighted that you found everything to your liking and that you enjoyed your stay with us so much. Hopefully we will see you again soon. We are so pleased that you enjoyed your stay with us so much and we hope to see you again soon. Warm friendly welcome. Room was immaculate and very nice. Very comfortable bed and wonderful ensuite. Absolutely loved the breakfast tray delivered to the door (at requested time) each morning. A great relaxing start to the day. WELL DONE. The Rudders is about a 10-15 walk into Lymington if you don’t want to take the car. We did this and was able to have a drink, but after walking all around the charming town and quay/marina area we got a taxi back for £5 which is nothing. Obviously, Beaulieu motor museum is only 5 miles away and is great day out, not just for ‘petrol heads’, the Palace house, Abbey ruins and grounds are wonderful to walk around. We had to go back the next day to finish off, which is included on entrance ticket. Thank you for taking the time to write this review and we are delighted that you enjoyed your stay with us so much. Hope to see you again soon. A warm welcome and a lovely room with an extremely comfortable bed. Thank you. Lovely walks from Quay along to the right - do a bit of exploring. Great walk from Keyhaven to Lymington - we got the X1 bus to Milford on Sea .. bit of a walk to Keyhaven but beautiful views across the Solent to the Isle of Wight. We are delighted that you enjoyed your stay with us and loved the breakfast. Hope to see you again soon. We were recommended the Ship Inn on the Harbour - excellent food with a great menu for veggies & vegans - would definitely recommend! We are delighted that you enjoyed your weekend stay and we hope to see you again soon. Excellent cleanliness, courtesy of the owner and easy car parking. We liked the way breakfast was served in our room, and the quality of the coffee was excellent. One slight small drawback - would have liked to have a more powerful bedside lamp. Within walking distance we have used the Fishermans Rest on previous visits and have never been disappointed. The owner is a real gentleman and cares about his guests and the quality of his property. The rooms were spotlessly clean. The breakfast basket was a treat to both view and eat. We really liked that the rooms were in a separate building attached to the owners house - you had your own key to come-and-go as you please without disturbing anyone else. I highly recommend Rudder's of Lymington! There appear to be several excellent restaurants/pubs in the Lymington area - we had time to visit only one but have others scoped out for next time we are in the area. I am so pleased that you enjoyed your stay with us and that you found everything to your liking. Hope to see you again. Clean and modern accommodation with a friendly and efficient welcome from Christophe. Nice website and good value for money. Large driveway making parking easy and useful to have own front door to rooms. Unusual breakfast, but very tasty. Would recommend. Good location for both New Forest and coastal towns of Milford on Sea and Barton on Sea, with views of the Isle of Wight and a lovely long walk along Hurst Spit. Lymington town centre is a short way away, with lots of shops and a lovely harbour. Lovely meal at Fisherman’s Rest pub, which is within walking distance. Easy to find - good spacious parking area Central location to Lymington so can leave car and easily walk into town Rooms are private - Room 3 on its own with own front door. Clean, extremely comfortable and well designed. Hamper breakfast a great idea - appreciated the early 7.30 delivery so we could get out early to make most of our day. Easy to book on-line, warm welcome on arrival, easy payment on leaving. Good all round stay. easy walk into Lymington Good Saturday street market Can recommend following: Solent Way Walk to Keyhaven Beaulieu House/Motor Museum for wet days New Forest easy access Ship Inn; Kings Head for good pub food - both have vegetarian menus. Lovely Bed and Breakfast! I strongly recommend it. Comfy beds, super breakfast, nice neighbourhood in the charming little town of Lymington. Idea place for touring new forest and beaches. So pleased that you enjoyed your stay with us and we hope to see you again. Welcoming, accommodating hosts. Well presented room. Generous breakfast hamper. Excellent high quality accommodation. We stayed in the room with its own patio. Lots of privacy, but owners on hand should we have needec them. We loved the breakfast basket. Lovely walk through nature reserve to Hurst Castle. We left the car on the driveway for the two nights we were there as the centre of Lymington is only a relatively short walk. Bases run right in front of the house, so able to walk and catch buses back. 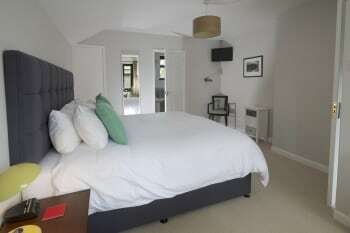 Everything a B&B should be, contemporary room with comfortable bed, quality linens and lots of space. Neat en-suite with good shower. Breakfast hamper provides flexibility to eat at leisure. Christoph is very welcoming and the whole booking and arrival process is efficient and trouble free. Thoroughly recommended. Thank you for taking the time to write this review and we are delighted that you enjoyed your stay with us so much. It's great to know that people love what we provide! We hope to see you again soon. It is always a great pleasure to stay at Rudders. Christophe and Zoe are so delightful and helpful.Our room was spotless and the breakfasts very enjoyable. We will stay again on our next visit to Lymington. As we spent our time with friends who live in Lymington, we went to restaurants recomended by them. There are so many great places nearby, such as Beaulieu and Buckler's Hard as well as the New Forest area, it is a great place to stay. Thank you for taking the time to write this review and we are delighted that you enjoyed your stay with us here again. We look forward to seeing you again soon. Lovely room which was very clean. It was nice to have a good selection of teas & coffee & bottles of water. The breakfast basket was lovely with fresh, local produce & plentiful for two. Would recommend this lovely b&b to anyone staying in the area. We enjoyed visiting the castle in Key-Haven. Lovely accommodation, quiet and immaculate. Lovely two rooms with own entrance for my family of five. Breakfasts were 10/10! Lymington tomorrow is a beautiful town with friendly locals. Had a great meal in the Kings Head after a fab day at Paultons. Took a pirate boat ride the next day around Lymington marina and drove to the beach at near Bournemouth. Perfect. 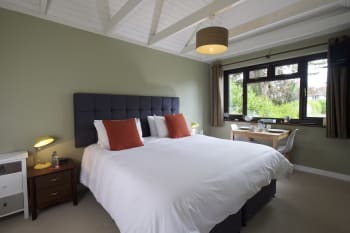 No complaints, perfect for guests who want to be left alone (some B&B guests enjoy chatting to their hosts over breakfast, some don't - this stay is for people who don't particularly enjoy that element!) Loved the breakfast hamper, was a real treat for it to be waiting outside the door smelling delicious! Our only comment was that if someone was staying there for a number of nights, the hamper might get a bit "samey" - it's great for one or two nights but any more than that and another option would probably be appreciated. Everything was delicious though and the local cheese was great. Perfect for exploring the area - we went to Milford on Sea and Bournemouth during our stay. Not in Lymington town centre, about a 15 minute walk into town, but we like walking so this was a plus for us. Thank you for taking the time to write a review and we are so pleased that you enjoyed your stay with us. Also delighted that you enjoyed the breakfast hamper and we agree with your comments on variety in the hamper, which is why we do change the contents for guests staying here for three or more nights. We stayed for 3 nights and the staff was very helpful and accommodating. Lovely place, very clean. Great breakfast delivered to your bedroom in the morning. Friendly service, great hosts, lovely room well decorated and very clean. We had a lovely stay. The beds were very comfortable and the breakfast was very tasty. 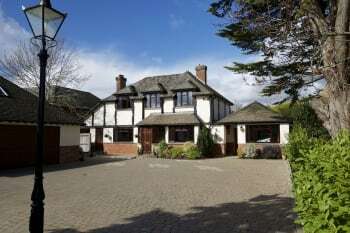 Within walking distance of the town which has lots of shops and restaurants. We would highly recommend your accommodation. A great location for visiting the New Forest. The room was lovely and clean. Bed was so comfy too. Fantastic choice for breakfast and so nice to have the luxury to eat it in our bedroom. Thanks so much, will definitely be returning. Beautiful stay in such a welcoming friendly environment, Chris delivered a good service food was perfect. I will certainly revisit and stay for a longer break. Stunning walking/cycling routes. Historic interest. Great restaurants and pubs nearby. Well worth a visit. -Room was lovely, clean and had everything we needed. -Breakfast was delicious and we enjoyed eating it in the comfort of our room. -Staff were welcoming and friendly. Lovely and clean. Extremely comfortable bed. Fresh local produce for breakfast. We stayed in the spacious patio room which would be particularly pleasant in the warmer, brighter seasons. It’s quiet, well thought out and set up for a comfortable stay. Wonderful breakfast hampers make a delicious start to the day. Prompt and cordial communications in the run-up to our stay, and a warm welcome on arrival; Christophe is a helpful and informative host. All in all, a perfect weekend away. The Saturday market brings Lymington to life. A great base and a good starting point for exploring along the coast and inland around the New Forest. Inviting coastal walks from Milford, and wonderful meals to be had at The Fisherman’s Rest and Rivaaz, Lymington, and a fine Sunday lunch at The Oak Inn, Bank, near Lyndhurst. A visit to St Thomas’ Lymington and St Matthew and All Saints Lyndhurst highly recommended; each very interesting. We are delighted that you enjoyed your weekend here so much. Also good to hear that the restaurant recommendations went down well! Owners were very welcoming. All facilities were of an excellent standard. A lovely place to stay, very convenient for our needs, the room was very comfortable and the breakfast delicious. Thank you. It was our pleasure and we are delighted that you enjoyed your stay. We are delighted that you enjoyed your stay with us and hope to see you again soon. Couldn’t fault the room or service. Lovely place and great breakfast. My girlfriend really enjoyed our weekend away for her birthday so thanks for everything. We had a nice meal at the Haven Marina Restaurant. Room was immaculate, the bed was huge, the shower worked well, and breakfast was delicious and filling. Within a mile of the High Street of Lymington. Lymington High Street, the Quay, the Harbor, the ferry to Isle of Wight, Beaulieau Motor museum, Sammy Miller Motorcycle Musuem - all within about 6 miles! Nice Breakfast loved the cheese. Very relaxing atmosphere. Happy to return one Day. This was the second time I've stayed at Rudders,& again I was not disappointed!! The owners are lovely, very hospitable, the room is by far one of the best I've stayed in & is well worth every penny!! The breakfast which is provided is brought to your room promptly at the time you have asked for, everything you get in your hamper is fresh & hot with 'more than enough' to 'keep you going' through the day. Will certainly be booking another stay with them! Rudders isn't far from the main town where there are places to eat & drink. There isn't too much of a drive either for things to see & do depending on what your interests are. So pleased you enjoyed your stay with us again and we hope to see you again soon. Very convenient location for Lymington town centre and the New Forest. Plenty of parking space on the property. Very roomy and private accommodation. Hosts have created a perfect balance of availability vs privacy. Hampers a great idea and a lovely start to the day. Would definitely stay again. The walks around Lymington as described in the leaflet provided in the room are very pleasant. Whilst there we ate at Koh Thai Tapas. Food was great and they have a lovely garden where we enjoyed after dinner coffee. Really good bar at Stanwell House Hotel and bistro. Great for cocktails. We're so pleased that you enjoyed your stay with us so much and it would be lovely to see you again. Great fish restaurant at the Haven Marina with views across to the Isle of Wight. Booking essential. A pleasant 25 minute walk to get there from Rudders. Thank you for taking the time to write this review and we are delighted you enjoyed your stay with us. Lovely breakfast hamper, especially the cheese from Lyburn! We tried out The Monkey House as recommended in the guest book in our room. It was really nice! Really pleased you enjoyed your stay (and the cheese) so much! A very nice B&B, very clean, very private in the garden room with your own space, excellent breakfast, walking distance to the town and local pubs, easy and plentiful parking.Couldnt ask for anything more. Can recommend The Ship Inn and The White Hart as lovely places to eat. Delighted that you enjoyed your stay with us and we hope to see you again soon. Our second stay at this modern, clean, well equipped B@B. Lovely fresh breakfast hamper delivered to your room at requested times, the smell of fresh cooked bread and croissants... a great start to the day. Christope the host is friendly and happy to adapt the hamper to your likings. We had the garden room this year, nice to be able to sit out in the sun/ fresh air. Highly recommend. The New Forest, Lymington, Christchurch and the beautiful Solent away walk all easily accessible. Bus stops close by. Lots of eating places dotted around, dependent on your likings. So pleased that you enjoyed your second stay with us so much and we hope to see you again soon. Thank you very much for a lovely stay at Rudder's. Christophe was a fantastic host and was very flexible with our plans. Really enjoyed our stay, room was beautiful and loved the little patio area. There is so much to do in Lymington from sailing on the Solent and swimming in the Salt water pool to walking the New Forest or simply sightseeing at the many local attractions. Fabulous location. Delighted that you enjoyed your stay with us and hope to see you again soon. Lovely people, lovely room, booking process was easy. Breakfast hamper was amazing! Good value for money All in all, would definitely recommend! The Huntsman pub in Brockenhurst is one of the nicest pubs we have been to, excellent food! Lovely room, very comfortable. Christophe was very helpful and the breakfast was great. Would highly recommend. Fleur de Lys at Boldre and Crown at Everton both good pubs to eat at. The accommodation is separate from the house, private, modern and. clean. Good sized bedroom and small but smart en-suite. 20 minute walk to town which has a good selection of restaurants. Breakfast is a hamper in the room delivered at an agreed time. Good selection of warm croissants, warm baguettes, cheeses, meats, fruit and yoghurts. Only downside is that the accommodation is on a busy main road. We didn't find that a problem - it isn't a tranquil spot but it is a good base to explore the area. We had a great meal at Rivaaz Indian restaurant and also recommend The Fisherman's Rest which is a 15 minute walk towards Keyhaven. We really enjoyed having the outside space and the fact that we were able to come and go as we pleased. Lymington is a lovely town and Rudders is a perfect base to stay to explore the area. The breakfast hamper is top quality and very nicely presented a real treat. Try the ship inn down at the town quay for a drink and enjoy the view. The kings head provides a good pub meal. There is a lovely walk in the leaflet provided in the room - walk 3 - which we did and we extended to include the chequers pub. Friendly and welcoming on arrival. Room was very clean and well stocked with different drink options. Breakfast was superb. We had a lovely stay, we felt very much at home and enjoyed every day. The breakfast was amazing and was a really nice treat to have each morning. Thank you for making us feel so welcome and looking after us from start to end! The Haven bar and restaurant is lovely, really tasty food and atmosphere! The Network Cars taxi service was so efficient, always on time and very friendly! Make sure to check out the lymington market on a Saturday morning! And longsdown farm was lots of fun! 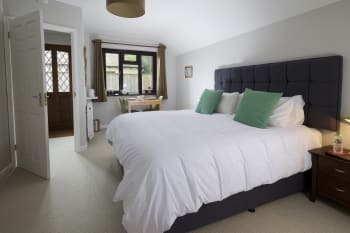 I have stayed in Lymington on 4 occasions and this has to be the nices B andB I have stayed in.From the friendly welcome to the excellent acomadation and the lovely breakfast I would have no hesitation recommending a stay here,and I hope to do so again,my self. I had dinner in the local restaurant,The Monkey Tree,where the food and service were excellent. Beaulleu car museum is worth a visit. Spotless, modern. Good shower. More a vanity sink than full sized. Bed comfortable. Breakfast hamper nice and fresh. Pub 5 minutes walk away, passing several take-always. I walked a bit further (15 mins) to a nice rural pub The Chequers which suited my purposes too. Absolutely brilliant stay, very comfortable, great night's sleep, superb breakfast. The host was very nice and very hospitible. The accommodation was really great, a lovely huge, comfortable bed and the breakfast hamper was to die for, absolutely fabulous! We will definately be back. Burley is a lovely place to visit. I booked this room for my brother and his wife. They said it was very clean and comfortable. The separate entrance to each room was great and the breakfast hamper delightful! They have already rebooked. Very well received and good distance from nearest town if wanting a walk. Very near to local shop and amenities. Set off the road and very quiet, typical large wooden forest house. Breakfast was fresh and plentiful. About 20 minutes walk into town for restaurants etc. We found it a very quiet location despite being on a main road. Very comfortable bed. We loved the breakfast in the morning and the rooms were lovely and modern and very cosy. We went to Milford-on-sea to the Verveine fishmarket restaurant - it was beautiful! Also we made the short trip over to the Isle of Wight which was lovely. Extremely comfortable, clean and very pleasant surroundings. It is always a pleasure to stay there, and the owners are very helpful and friendly. As we were meeting up with friends who live close by, we enjoyed visiting their Yacht Club and the occasional good pub. Thank you for taking the time to write this review and we are delighted you enjoyed your stay with us. It was a pleasure to see you again and we look forward to seeing you again soon. Friendly and helpful, just right for a short stay. Friendly hosts. Beautiful young daughter. We were worried that our 18 month may have woken household in the night as she was awake very early as clocks went back, but no we did not hear either child. Shower was lovely and powerful. Fantastic breakfast wow it really fills you up for the day, best breakfast ever had at B&B. Would recommend to anyone looking for place to stay. Some lovely walks along the sea front and marina in Lymington. Very hospitable hosts who managed to source us a gluten free breakfast at very short notice. Unintrusive though on hand if we needed anything. Accommodation was very comfortable and exceptionally clean. Beds fantastic, room comfortable and with everything we needed for our short stay. It was lovely to have a breakfast hamper delivered and have a little table by the window to sit and enjoy a leisurely breakfast. Bedding and towels also lovely. Slept really well and room was surprisingly quiet despite it being set back off quite a busy main road. Thanks Christophe! Good quiet roads and off road cycle paths got us to and from the accommodation, taking in Brockenhurst, Lymington and a bracing walk around Keyhaven and Milford on Sea. Easy low effort day trips for cyclists with lovely scenery and plenty of cafes even out of season. This was a unique experience for us, our room was lovely due to having use of a private garden. It was very clean and the bed was extremely comfortable too. We enjoyed the breakfast hamper,as the local produce was delicious. Our hosts were friendly,which helped make this a memorable stay. The b and b is in a good location for getting around by car. Several beaches close by, and Beaulieu only 10 to 15 mins by car. Also you could walk to lymington in half an hour or so. The Ship Inn, lymington had good food. Lovely spotless room , thought the breakfast was fantastic especially as it had local produce . Nice to be able to come and go as we pleased . The bed was so comfy and the sheets were very luxurious . Recommend Lanes of Lymington and The Crown as places to eat. 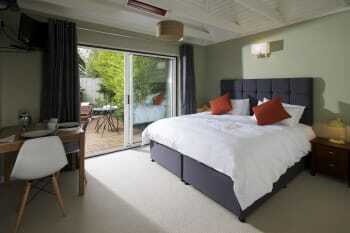 The accommodation at Rudder's of Lymington, is new, with a modern ensuite, comfortable bedding, in pleasant surroundings. The breakfast delivered to your room is plentiful and a good range of tea and coffee is available. 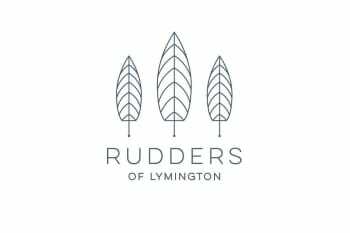 Rudder's of Lymington is within walking distance of the high street, where you would find everything you need. The old town by the river is a step back in time, and a great place to relax and watch the many yachts. Plenty of good quality pubs serving great food, close to the New Forest and lovely villages. We had a very nice stay for 4 nights, and would definitely return. A Friendly & comfortable base. Thank you. Very relaxing stay. Thank you. Wonderful host family providing a lovely B&B service. Immaculately clean room with a wonderful and private patio area just outside the room. Thank you !!! This is a lovely place to stay.The breakfast was top quality goods and the rooms perfect for a stay,clean,well decorated and plenty of parking. Christophe and Zoe were very welcoming and friendly to this lovely, contemporary b&b. The breakfast hamper is wonderful with warm croissants and baguette and local tasty cheese and quality ham. The Illy coffee and cafetière were very welcome. A short walk into lymington with local shops closely. Highly recommend. We are delighted that you enjoyed your stay with us and thank you for taking the time to write this review. We hope to see you again soon. As you know I booked the stay for my son and daughter in law and they had a wonderful stay - in fact they want to book again (when I am free to babysit!). In the meantime I will be contacting you to book for my husband and myself to have a short break. They thought the breakfast hamper was an excellent idea, and the room was lovely. Only one tiny negative - it would be good to have access from 3pm instead of 4pm. Thank you for making their stay so memorable. So much to do locally. You could spend two weeks at this location and still run out of time! The cliff top walk to Barton is a must as is a visit to Milford and of course Lymington particularly on a Saturday when they have a 'real' market. We stayed in room 1 which was fantastic, very roomy, clean and stylish. We really enjoyed the continental style breakfast served in the room. Would recommend Rudder's to friends and family. We ate at the Blue Pig and Anchor... and the Walhampton Arms, which was across the river from Lymington. Both good food. Lovely B&B - exceeded our expectations! The private garden room was quiet and peaceful. Love the comfy beds. And the breakfast basket included everything we love...more than enough food for us to make a small picnic lunch! The room and facilities were of a very high standard. The bed was huge and very comfortable. The breakfast hamper left at the door was a great idea, with baguettes, croissants etc, a nice change to the usual 'full English'. Would highly recommend this to anyone wanting to stay in the area. There are plenty of interesting places to see, we visited several including Christchurch and Hythe. Lymington town centre offered plenty of shops and restaurants. We arrived on Monday and found a lot of the restaurants closed for the day so we decided on Wetherspoons, The Six Bells, for lunch. The food was ok and reasonably priced. We also tried the highly awarded Indian restauarant Rivaaz, we thought the food less than average and quite expensive. Our last night we tried Lymington Fish Bar, great value and great food. It was very clean, service was great and highly recommended for a quick, cheap meal. Very friendly welcome upon arrival and wonderful breakfast hamper delivered each morning at your chosen time. Room 3 was spacious and modern. Had a relaxing time. Really nice friendly welcome, very nicely decorated room with private courtyard garden, and the hamper breakfast in our room was spot on for us, a much nicer option than a fried breakfast in a communal dining room. The only downside was that it took a little longer than expected to walk into Lymington, but that helped walk off our dinner in the evening! We would definitely come back if we are staying in Lymington again. We ate at the Ship on the Quay. 25 mins to stroll down. Good menu, and nice to eat looking out over the harbour. The saturday market os always good to stroll around.